Cuisinart has thrown itself headlong into the world of grills. In recent years they have come out with charcoal, propane, natural gas, and even wood pellet grills. 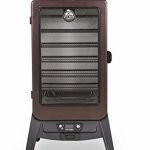 One niche where they have gained the most traction is in with small, or otherwise portable gas grills. 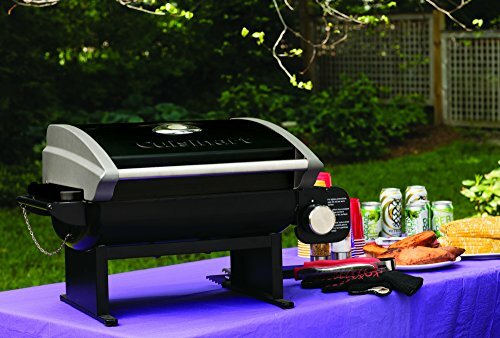 The Cuisinart CGG-200B Tabletop grill is designed to run on a 1-pound propane tank for maximum portability. Yet it is still large enough to live on your patio counter. If you aren’t planning to use it exclusively as a portable grill, you should consider upgrading to the adaptor and hose which will allow you to connect it to a larger propane tank. It has a twist-start igniter to fire up the 12,000 BTU propane burner. The heat deflector also helps to provide more consistent heat distribution. The grill grates are made from heavy duty cast iron, that’s been porcelain coated. This is a step above competitor grills in this class, which tend to offer stainless steel or chrome plated grill grates. Cuisinart does their best to infuse quality with affordability in all their cooking devices. Whenever possible they like to also include a splash of innovation. 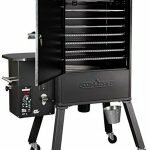 For the most part, the CGG-200B Tabletop grill is a quality unit. The porcelain coated, cast iron grill grates are certainly a step above the competition. Yet there are some minor flaws in the design and material quality. The heat deflectors can fit a little loose and take extra time to install. There is no official grease management system, and the flame ports can be prone to gumming up if you are making something with excess marinade. 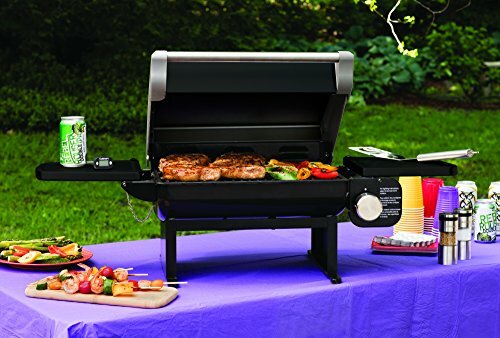 However, these are common complaints that you find with most grills in this price range. Assembly can be a little more time consuming than you might expect. The nuts and bolts in the bottom of the firebox can be particularly fiddly and require nimble fingers. The heat deflectors also need some extra patience to install, as they can be loose, and need some extra effort. If you take your time to put everything together you should be able to take it out of the box and ready to grill in just under an hour. The Cuisinart CGG-200B Tabletop grill produces up to 12,000 BTUs of heat. The cast iron grill grates with their porcelain coating then absorb this heat to produce a really nice sear, as well as provide better heat consistency. The U-shaped heat deflectors over the propane burner element also help with heat distribution. Just keep in mind that if you are grilling something with some excess marinade or drippings, that it can gunk up and even smoke a little as it collects on the heat deflectors. When this happens, it can potentially drip down to clog a flame port or two. The Cuisinart CGG-200B Tabletop grill doesn’t have the ability to create two separate heat zones. If you want to do something like hybrid grill bone-in chicken, or thick cut pork chops, you will need to set the fire to it’s the lowest setting to cook them through. Then make a tent or pouch out of heavy duty aluminum foil. Let them rest for three to five minutes while you crank the grill up to its highest flame. This will give the cast iron grill grates time to absorb the heat. You can then lay the meat back on the grill grates to produce a flavorful and visually appealing sear. From time to time wind can be an issue with this grill. If it is going to be a particularly breezy day, you should make a point to set it up out of the way or around the corner from the direct gusts. Placing a folded up piece of aluminum foil near the hinge of the lid might also help to protect the burner elements from the wind. 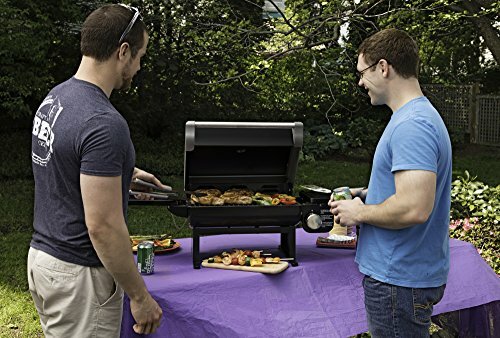 The Cuisinart CGG-200B Tabletop grill provides 240 square inches of grill grate cooking space. With careful placement, this should be enough for four or five hamburger patties or three ribeye steaks. The twist start igniter is a nice touch and keeps you from having to mess around with matches or a stick lighter. The Cuisinart CGG-200B doesn’t have any sort of grease management system. So, cleaning excess drippings out of the bottom can be a bit of a chore. If you know that you are going to be cooking something particularly messy, you might want to try lining the bottom of the firebox with a sheet of heavy-duty aluminum foil. If the heat deflectors get messy, you should give them a light scrub down with a nylon bristled grill brush. The cast iron grill grates have a nonstick porcelain layer on them. This makes it easy to scrape them down. If they are particularly messy they can be soaked in water. The porcelain will protect the cast iron from rusting. If a flame port or two in the burner element gets clogged, you should wait until the grill cools down. Then you should be able to clear it with a wooden grilling skewer or toothpick. The Cuisinart CGG-200B has a warranty that covers defects in parts and workmanship for a period of 3 years from the original date of purchase. This is superior to most other competitors in this class. The Cuisinart CGG-200B is an affordable, portable gas grill, with a warranty that stands head and shoulders above its competition. The porcelain coated cast iron grill grates are something you don’t often find in this price range. Yet the Cuisinart CGG-200B does have a few minor flaws. You have to take your time to reduce cleanup problems, and you might need to take some extra time to clean it up.